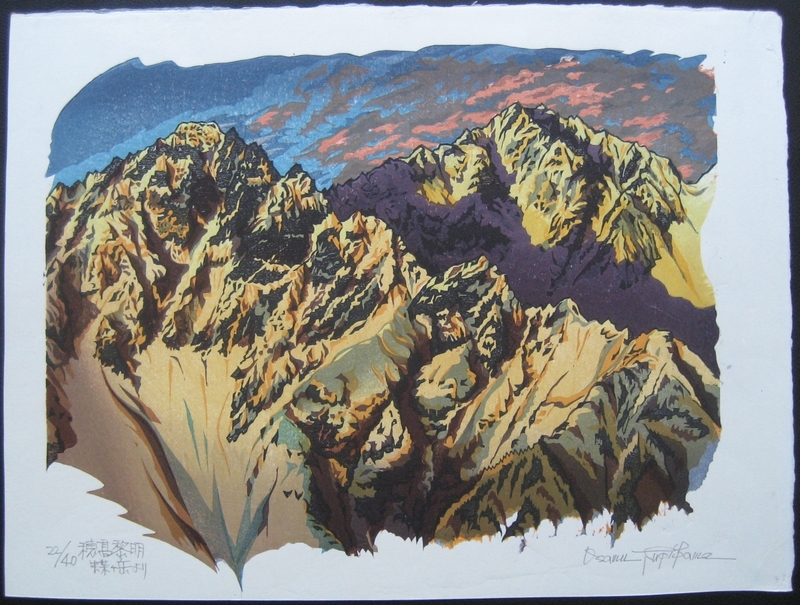 Description: This woodblock print is from a series of Japanese mountains by Osamu Sugiyama. Self carved, printed and published by the artist, on heavy weight (cardboard like) paper. Signed “Osuma Sugiyama” in pencil in the lower right margin. Titled and numbered 22/40 at lower left margin, all in pencil. The print has a paper size of 13 1/8" by 17 1/2" and the image is 12" by 15". Eight blocks and sixteen colours were used in making this print. As is typical of Sugiyama's prints the image extents across the image borders. The scene is of a closeup high altitude view of Mt Hodaka which is located in the northern Japanese Alps.